If you’ve never been to Kansas you’re not missing much. If you’re unlucky enough to drive through the capitol of Kansas, Topeka, you can clearly see that the recently re-elected governor, Sam Brownback has left his handy work of cuts to everyday and much needed services such as school funding and even police. Every house I saw while driving through there was falling apart and was very unkempt. Stray animals everywhere in neighborhoods! The roads are a complete mess. Even the highway roads are plagued with potholes. Bridges over the “rivers” are in danger of falling apart at any moment. The governor has left his mark and is continuing to do so as we speak. It was made very clear by the Kansan people that they do not approve of his methods and “morals” as the leading Kansan Republican to run for president in the next running. Not only is the city, schools, and essential services a mess, but trying to find a place of living in a ‘decent’ neighborhood seems like an unending ball of frustration if you ask me. I don’t actually think that there are any decent neighborhoods in Topeka, KS. 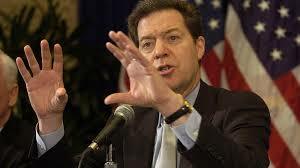 Hearing governor Brownback being booed by his own people should tell you exactly what’s wrong with this city and state. They’re all backwards!